Like any profound technological breakthrough, the advent of sound recording ushered in a period of explosive and imaginative experimentation, growth and competition. 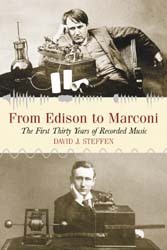 Between the commercial debut of Edison’s “talking machine” in 1889 and the first commercial radio broadcast three decades later, the recording industry was uncharted territory in terms of both technology and content. This history of the earliest years of sound recording–the time between the phonograph’s appearance and the licensing of commercial radio–examines a newly created technology and industry in search of itself. It follows the story from the earliest efforts to capture sound, to the fight among wire, cylinder and disk recordings for primacy in the market, to the growth and development of musical genres, record companies and business practices that remain current today. The work chronicles the people, events and developments that turned a novel, expensive idea into a highly marketable commodity. Two appendices provide extensive lists of popular genre and ethnic recordings made between 1889 and 1919. A bibliography and index accompany the text. I continue to guest lecture from time to time so feel free to email me: jazzdavid@aol.com.